It was a soulful night. It was the best of nights. August 14th at the Kalayaan Centre will be deeply remembered in the memory of many friends and family members of Leander Mendoza. 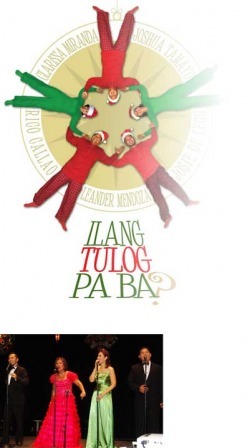 Kalayaan Centre dazzled guests with the versatile performance of Leander Mendoza with guest singer Josie De Leon. Kalayaan Centre rolled the red carpet for Leander’s concert with white linen covered tables and chairs, a grand stage, bright glebe of lights, hearty music and sound effects typical of a Broadway show. Trays of appetizers and hors’ douvre, flowing wine filled the ballroom to start the night. 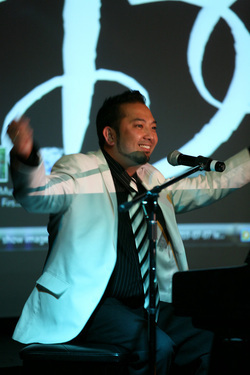 As an introduction, Leander sang “This is the Moment” followed by “Tonight” and as a special gift to his parents, Leander delivered an exceptional wedding anniversary song “The Way We Were”, a song that brought memories of love and courtship days to his very surprised parents, Pete and Lucy Mendoza. This was his way of honouring his parents on this day, their 40th wedding anniversary. Parents, couples and families in the audience were filled with love and tears as memories of childhood and family life were presented in a video presentation. Leander sang favourites of young and old alike from “Granada, Solo Mio” to Tom Jones famous “It’s not unusual to be loved by anyone”. With a special song for his mother and all the mothers in the audience, Leander brought the house down when he sang “Aking Inay” and from that point on the audience was mesmerized by the rest of the evening’s song list which brought to stage Josie De Leon who together sang “Music of the Night” and “All I ask of You” while donned in outfits that replicated the actual Phantom of the Opera. Then Tom Jones came alive with the song “It’s not unusual to be loved by Anyone” and with that bouncy tune, the audience started to dance and sway to the music. Josie De Leon followed with “Dream Girl” and “I Am Telling You”, rendition equally charming the audience with her tantalizing voice. The gleeful crowd singing and dancing was overwhelming. The fundraising was a real success. Guests were inspired and entertained and, of course spirited with both the wine and song. The concert was a manifestation of the saying “music is the mirror of the soul.” There was nobility and expressions of the heart in sharing great talent of the singers and the volunteers of Kalayaan Centre volunteers. Congratulations to Leander, Josie, Mama Ching, for such an inspiring event. If you miss this show, come for second performance. You have to ask for it. Leander led the group in “Mary Did You Know?” which brought the four back together on stage in an energetic blend of notes that gave way to chill on the spine and goose bumps.